Twenty-five years after it first premiered on television, 'The Next Generation' is finally going where it hadn’t gone before: Blu-Ray. 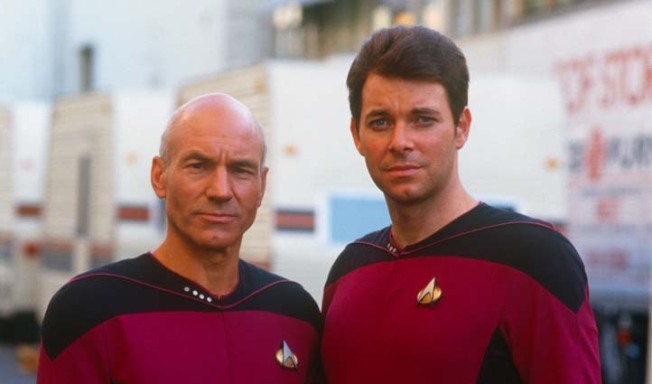 Patrick Stewart and Jonathan Frakes in "Star Trek: The Next Generation" which is now available on Blu Ray. While it picked up the mantle of the original ‘60s series, “Star Trek: The Next Generation” also created a phenomenon of its own, becoming one of the leading syndicated, off-network series of its day. It showcased state-of-the-art special effects and proved to be more that twice as durable as its short-lived predecessor with a seven season run. Michael Okuda has long been associated with the “Trek” franchise (as well as the real-life space program as graphic artist of mission patches), beginning with designing computer displays for the original cast’s feature films. A gig that set the standard for the look of Starfleet’s tech and became known within the productions as “Okudagrams.” On “TNG” he would serve as a technical consultant on each of the four “Trek” spin-off series, and eventually he and his wife Denise would team to write several informational and reference books about the franchise, most notably The Star Trek Encyclopedia and The Star Trek Chronology. Since then, the Okudas has been deeply involved with the “Trek” home video releases, and their latest labor of love has been prepping “TNG” for transfer to Blu-Ray, a surprisingly Herculean task given that the original episodes were edited and effects were composited on video. This required a complete restoration of the film elements for a high-def upgrade. The Okudas opened their hailing frequencies to brief PopcornBiz on how they made it so. This has got to be as exciting a time to for you as it is for the 'Star Trek' fans, to see the show finally come to Blu-Ray. What was your role in the process? Denise Okuda: This is a project that's been in the works for quite some time at CBS. David Grant and Ryan Adams have been tenacious in their desire to bring 'Star Trek: The Next Generation' to Blu-ray HD for many, many years. They called us about two or three years ago and kind of explained what they wanted to do and asked if we wanted to come on board. And, of course we said, 'Yeah, that sounds great!' But the project is so enormous. It's so immense and complex that to do it right would've been almost impossible. So we hung up the phone and Mike and I looked at each other and we both said, almost at the same time, 'It'll never happen.' And a true testament to the folks at CBS, it's here. It wasn't impossible. And it is a minor miracle because they are doing it right. And, you're right: we are very excited. What are some of the things that you think the fans are truly going to appreciate? Michael Okuda: On a very nuts and bolts level, first we were brought in to look at that early test, frankly, what they were thinking of doing was taking the original standard definition video, which at the time, of course, was absolute state of the art, and enlarging it and using various animation techniques to make it look as good as possible. And it looked…pretty good. But we said, you know, 'If you do this, people are going to go, "Geez. It doesn't look that much different from my DVD."' And so the fact that they stepped up to the plate to say, "Hey, let's actually take the effort to rescan all the films. Let's go to the expense of rebuilding the edits. Let's go to the expense of reconstructing all the visual effects,” was hugely exciting. That they're taking all of the artistry that was already there, all of the beauty of the images, of the sets, of the costumes, of the cast members, and revealing it in clarity and detail and color that was never shown before is enormously exciting. And the original “Star Trek” series Blu-Rays did something really interesting when they actually upgraded the special effect sequences to modern standards and gave you the option of watching it both ways. Are there any sorts of upgraded effects for “TNG?” Was that a part of the discussion this time around? Nichelle Nichols: MLK Convinced Me To Stay On "Star Trek"
At PBS' Pioneers of Television event, Nichelle Nichols talks about how she almost left her iconic role as Uhura in "Star Trek," but how did a chance meeting with Martin Luther King Jr. convince her to stay on the classic sci-fi series? Michael: This project is very different in that particular respect. When we did the original series the actual film elements did not exist because it was done so many years ago. Even though they had the camera neg and the cut neg, they didn't have the blue screen pieces of the ship and the planets and things like that. This time Paramount painstakingly archived virtually all of the original camera elements, so even though these are new effects, they're really constructed from almost all of the original elements. So there's – we hope – much less of a visual difference. In this debut ‘TNG’ set, was there an episode that, when you saw the finished project, you thought 'That is stunning. I am seeing this story told in a way that I hadn't even imagined, as many times as I've already seen it'? Denise: Well, we had many of those moments. In fact, a lot of times at CBS Digital when we do our weekly visual effects review, the meeting will come to a complete halt because we'll just go, 'Wow – Look at that!' I think 'Encounter at Farpoint', when we first started this project – that was the first episode that we did, and we were, frankly, amazed at the quality. Two of our coworkers, LaVar Burton, who played Geordi La Forge, and Mirina Sirtis who played Counselor Troi came one day just for a session to take a look and they both were just speechless and they were very excited. And this is like a year ago, so there are several episodes [now]. Another one is 'Where No One Has Gone Before', which, by the way, is being screened in theaters across the country this July the 23rd, along with 'Datalore'. 'Where No One Has Gone Before' has beautiful footage of the Enterprise on the edge of the universe, and we're very excited, even to see that projected. Michael: One very small thing, which just shows how different this edition is, was Mirnia Sirtis's costume: she had this little wrap of little tiny red jewels in her hair throughout the entire first season, and in standard definition you can see the jewels, and you can sort of see that they're red, but the color was lost in the color compression in the SD video. Now if you look at it in the HD in the remastered version, they're beautiful, they're vibrant, and it just brings a little bit of extra sheen to her character. Were there any unexpected discoveries as you were searching through the various archival materials for what you needed to assemble this? Denise: Yes – actually, there's a couple. But the one that really comes to mind is at the opening of each episode you see the Enterprise departing at the very end of the opening. And you can actually see what you think are people walking around. You can see through the window. And very early in the project we were shown the pencil drawings that were used to represent the people walking through the window. And we were just blown away. We had not seen the pencil drawings before. And although we were very familiar with the finished product we were really excited. 'Star Trek' fans are an insatiable bunch: When will all seven seasons be available for everybody to have the complete library? Michael: As soon as we can! Denise: We're working very hard. It's an all-consuming project. And, I don't know: A couple years. But we're really, really happy with the way things are turning out. And, like I said, we are really excited because we've had this fun toy and now we get to share it. And along with having hands-on involvement in the original series, the two of you have been real caretakers of the 'Star Trek' franchise, and 'Next Generation' in particular, over the years. Michael: One of our first projects of that kind was when Gene [Roddenberry] was still alive: they had a meeting, which we weren't at, where a lot of licensees – the people writing novels and comic books and stuff like that – they were having a very hard time maintaining continuity with the 'Star Trek' title line because they hadn't written it down anywhere and finally they realized they needed to have it written down. There needed to be a standard reference for all 'Trek' writers, as well as staff writers, to use, and they're going, 'Oh my gosh - this seems like a daunting task. Who should we get to do it?' And Gene very kindly suggested us. Given that this year is the 25th anniversary of 'Next Generation,' tell me what you think was particularly special about that incarnation of 'Star Trek’ – probably the most widely popular, when you get down to it? Michael: 'Star Trek: The Next Generation' was in many ways the rebirth of 'Star Trek'. The original series had done, after the fact, very well. And, of course, there were the successful films. But 'Star Trek: The Next Generation' was the series that showed that the format, that Gene Roddenberry's vision was so strong that you could do it and be successful even without Kirk and Spock. When we started 'Star Trek: The Next Generation' there was intense, understandable skepticism by the fans: 'How dare you replace Kirk and Spock?' Well, we didn't replace Kirk and Spock. Kirk and Spock continue in the movies – and now even in the present films – but we added to the fabric of the universe. And it's bigger, richer, cooler, more interesting, more diverse. And that was a huge challenge, and we're so very proud to have been part of that.